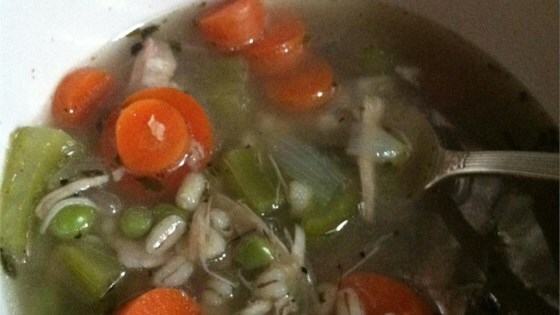 "Just the best turkey soup ever. If you brined your turkey, you will need to add less salt to the soup." Bring water and turkey carcass to a boil in a large pot; add 1 1/2 cup chopped onion, 3 stalks celery, 1/2 cup chopped carrot, peppercorns, 1 pinch thyme, and 1 bay leaf. Simmer, skimming excess fat and foam from top of stock as needed, 2 to 2 1/2 hours. Add more water to stock as it evaporates. Remove carcass from stock and cool. Pull meat from bones and shred; refrigerate until needed. Strain stock and return liquid to pot. Mix 1 1/2 pounds carrots, 2 onions, 6 stalks celery, barley, mushrooms, 2 bay leaves, salt, marjoram, black pepper, and 1 pinch thyme into turkey stock and bring to a boil. Reduce heat and simmer soup, stirring occasionally, until barley is fully cooked, 1 hour and 20 minutes. Add turkey meat to the soup and simmer for 10 more minutes. Remove bay leaves before serving. This soup was awesome! Only thing I added was a little extra salt. My husband actually said "wow!" And started telling his friends how good it was! Will DEFINITELY make this again! I added some roasted andule sausage (1 lb) to the pot at the same time I added the turkey. it was exactly what I hoped for. silky with a touch of spice. Great flavor! I added more veggies to make it even healthier. Perfect way to use your leftover turkey from Thanksgiving or Christmas! Excellent! Added cumin for a more smoky flavor and even mix of carrot/parsnip. My 2 1/2 year old liked it so much that she wanted to drink some of the broth for her nighttime snack lol! Keeper.